Hubli: International Society of Krishna Consciousness (ISKCON) authorities performed the ‘bhoomi puja' for the construction of Radha Krishna temple and cultural complex at Rayapur between Hubli and Dharwad cities on Sunday. District in-charge Minister Jagadish Shettar, the former Ministers Basavaraj Horatti, S.R. More and Jabbarkhan Honnalli were among those who participated in the function. Junior pontiff of Pejawara Adhokshaja Math Vishwa Prasanna Tirtha Swami and Murugha Math seer Mallikarjuna Swami were present. 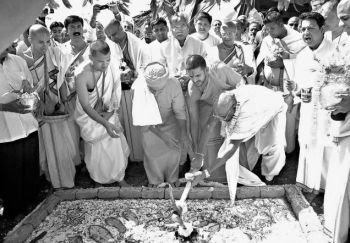 Foundation laid: Mallikarjun Swami of Murugha Math, Vishwa Prasanna Tirtha Swami of Pejawara Adhokshaja Math and president of ISKCON, Bangalore, Madhupandita Dasa performing bhoomi puja for the construction of temple and cultural complex at Rayapur in Dharwad district on Sunday. 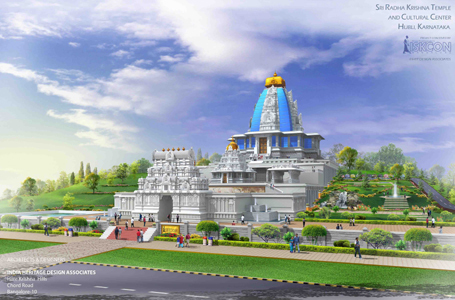 President of ISKCON, Bangalore, Madhupandit Dasa said all the temples were like the embassies of ‘vaikunta'. “Temples are embassies of ‘Vaikunta', the spiritual world in this material world”, he said adding that temples provide an opportunity for rendering various devotional services to the Lord and enabled a devotee to get visa to the spiritual world. Mr. Dasa called upon the people of the twin cities to join hands with the organisation in building the cultural complex. Vishwa Prasanna Tirtha Swami said ISKCON was rendering yeoman service to the society at large by spreading the teachings of Lord Krishna. Rural Development and Panchayatraj Minister Jagadish Shettar and the former Minister Basavaraj Horatti were all praise for the services rendered by ISKCON. The Ministers said recalled their role in sanctioning the land for the Hubli-Dharwad unit of ISKCON at Rayapur when they were ministers in the previous BJP-JD(S) coalition government. Vice-President of ISKCON, Bangalore, Chanchalapathi Dasa spoke on the activities of ISKCON in Hubli.